The Hindu Education Society Kashmir was established by some philanthropic Kashmiri Hindus in 1943 with an objective to impart high quality academic institution to deserving and aspiring Kashmiri Hindu students and acquainting them with the fundamental tenets of Hindu faith.HESK based on the belief that cross-cultural interaction creates an effectiveness and dynamic learning environment. The society was registered as community society under J&K Societies act vide no.324/9 Dtd.Jan.9.1945.In keeping with the highest secular and progressive traditions of Kashmiri Hindu society HESK (Regd. 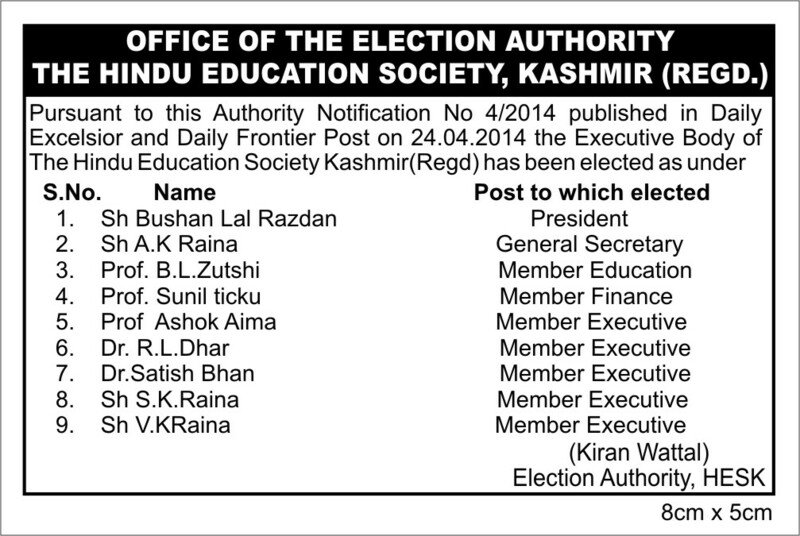 ).The society has done a yeoman service in spreading and popularizing education in J&K. The Hindu Education Society Kashmir has come a long way providing education, enlightenment of thoughts, words and deeds from nineteen forties in the field of education in J&K continuously propagating liberal education, imbibing rich cultural heritage, transforming excellence among students, generating avenues of work for meritorious and needy persons, creating congenial atmosphere of teaching and learning.The Hindu Education Society Kashmir in general and the management in particular are always vigilant with the co-operation of teachers with a hawk's eye to maintain and attain objectives of the society. The value based education, noble and honest efforts and the dedication of the management helps in spreading education in the society .The institution under the able guidance and leadership of its management committee is strengthening the dream of cultivating the institution into an university. With the experience and expertise of the management committee, the GMCEJ has developed into a guiding institution.